The last day of our stay at Amilla Resort holds a pyjama clad breakfast, a decadent around the world wine and cheese tasting as well as a journey of Japanese food that goes up, down and all around! One of the most enjoyable things to do on holidays is to have an in room breakfast. There's no need to brush salt tangled hair or put on makeup to eat breakfast (the latter a ritual I discarded on my first day in the Maldives). The night before I had placed an order via Amilla's in room iPad and at 8:30am (it was scheduled for 10am-oops!) there is a knock at the door. Mr NQN rushes to put on a robe and they set up breakfast on the patio. 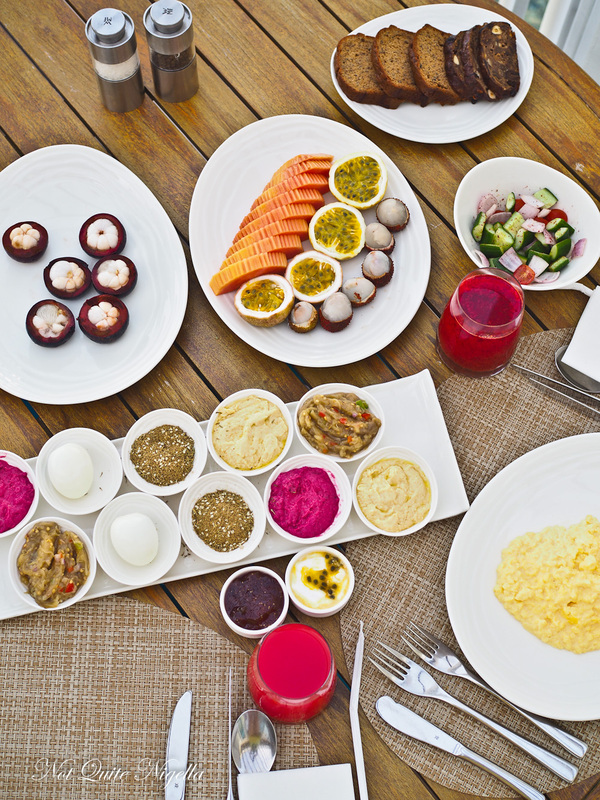 Our breakfast is made up of tropical fruit, yogurt, freshly made juices, truffle scrambled eggs and an Arabic Mezze breakfast with hummus, baba ghanoush, beetroot dip, za'atar and a boiled egg. Alas there is no pita bread today but that doesn't stop us from feasting on this extravagant spread. Then we butter the fantastic date and fruit bread (recipe here, you must try it!) and a banana and date bread and slather it with house made fig jam and sit back and watch the water ripple bewitchingly in front of us. 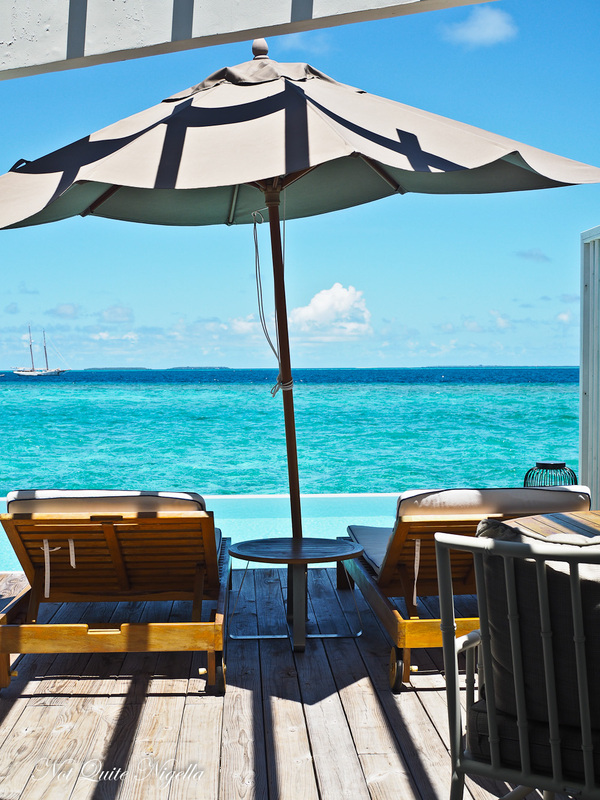 The day is ahead of us and we snorkel, rest, watch television and just recharge. It's funny how fast time can pass. Before we know it, our tummies are rumbling. 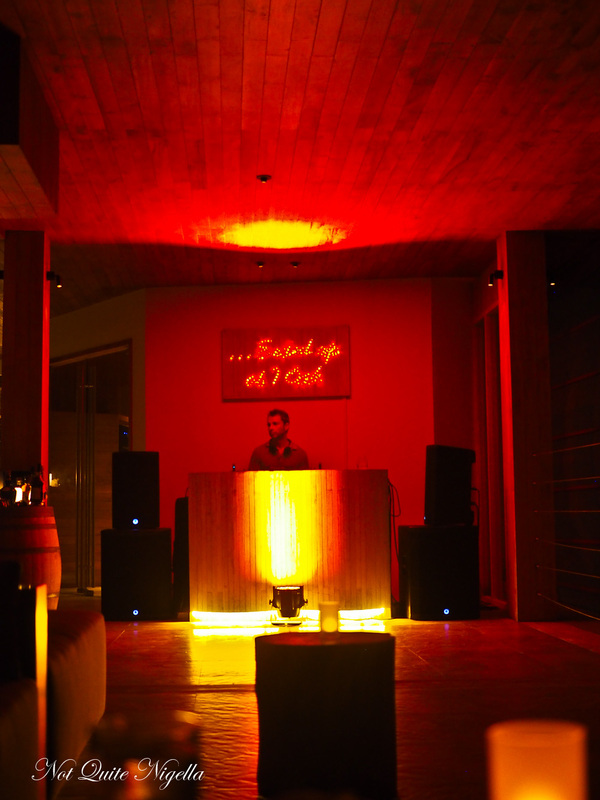 Keen foodies can book Amilla's cheese and wine tasting experience in the Emperor's Beach Club. 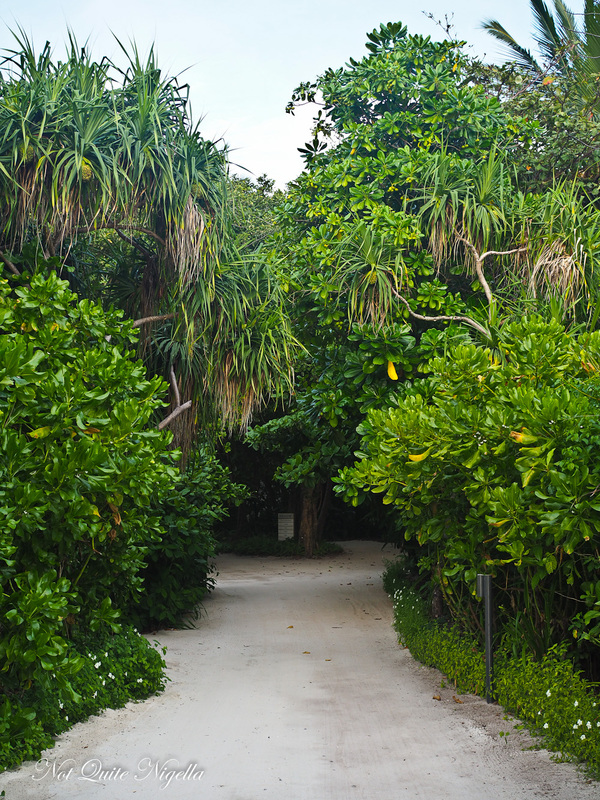 It is usually the spot for a quick lunch where there is music, games and lunches. 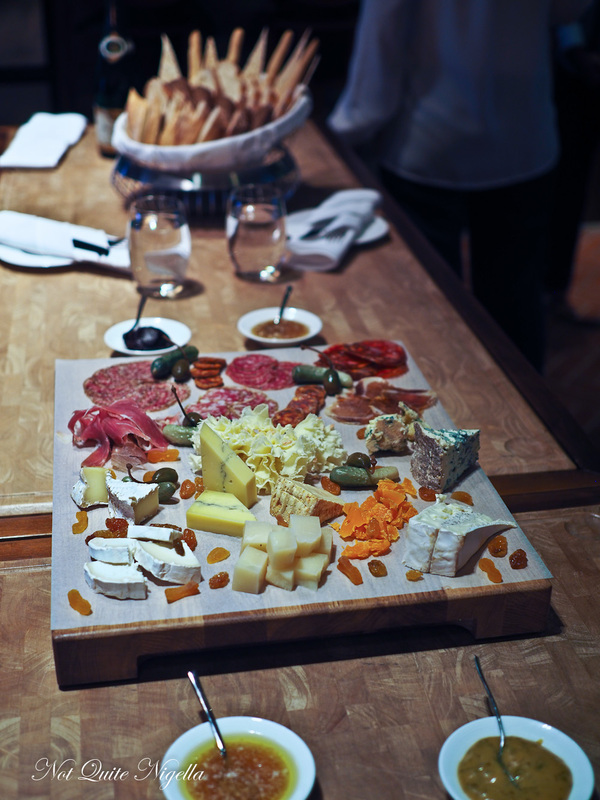 During the tasting Beatrice Ubl will take you on a wine, cheese and charcuterie flight. The experience starts with a glass of Testulat champagne which she explains is a boutique wine house with only 15 handpicked hectares. We move in the cellar for a look around and then to the main room where a platter of cheese, charcuterie and breads are waiting for us. 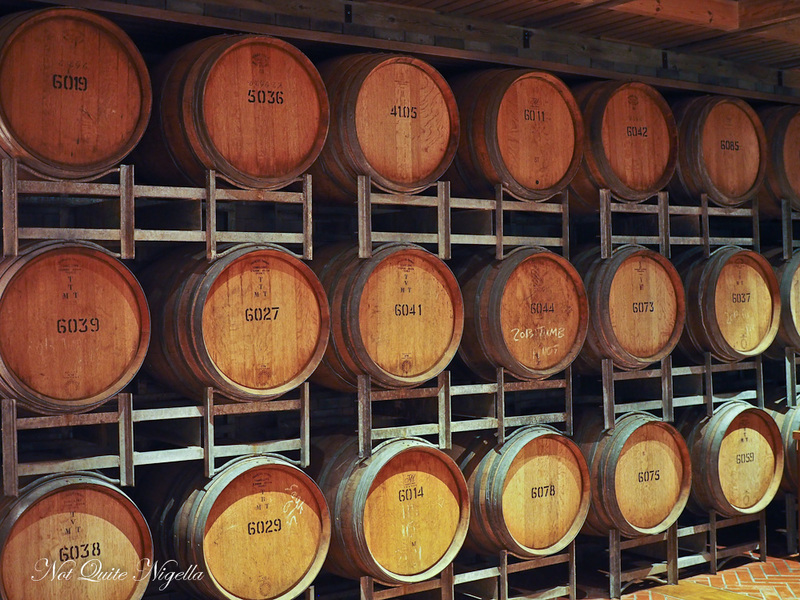 Amilla guests are welcome to wander into the cellar to purchase wine or to select the wine preferences stocked in their wine fridge. 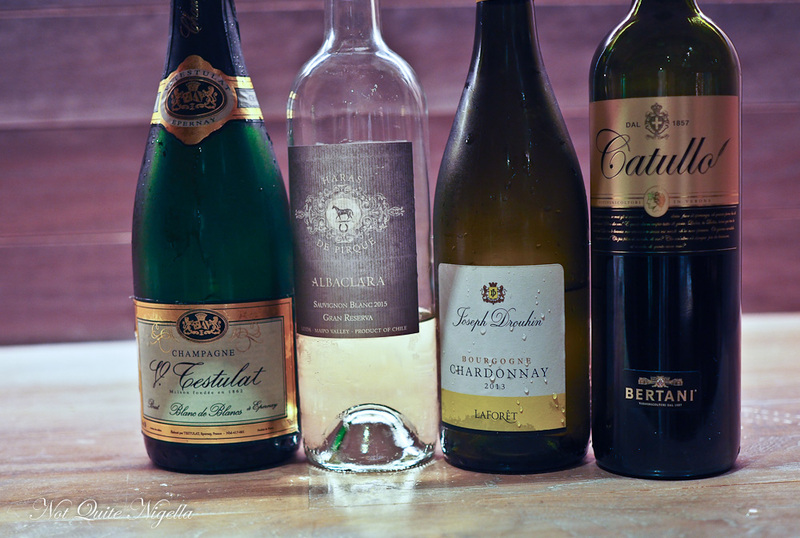 The tasting is $250USD per person and this is partly because the duty on alcohol in the Maldives is high with a typical bottle of champagne around $300USD. Usually Beatrice doesn't open any bottles until the guests have indicated a preference. She pours some 2015 Haras di Pirque Albaclara Sauvignon Blanc from Chile and explains that today's wine tasting will involve new and old world wines and they are designed to either contrast with the cheese or be in the vein as the cheese. There is an extensive range of ten mostly French cheeses starting from a Loire Valley goats cheese, an Ossau Iraty sheep's cheese, Mimolette from Lille, Brie with cream cheese with pepper from Normandy, Camembert washed with Calvados, Morbier from France, Tete de Moine from Switzerland, Form d'Ambert from Avergne and a Stilton from England. Beatrice peppers the tasting with stories about the cheese and explains that the Mimolette cheese is dubbed the pumpkin cheese and the story behind this is that it was first given by the Dutch to Marie Antoinette as a gift. As relations between the two countries soured the French wanted to find a way to make the cheese that was no longer available and they found the best suited conditions in France for it. It is similar to a gouda. 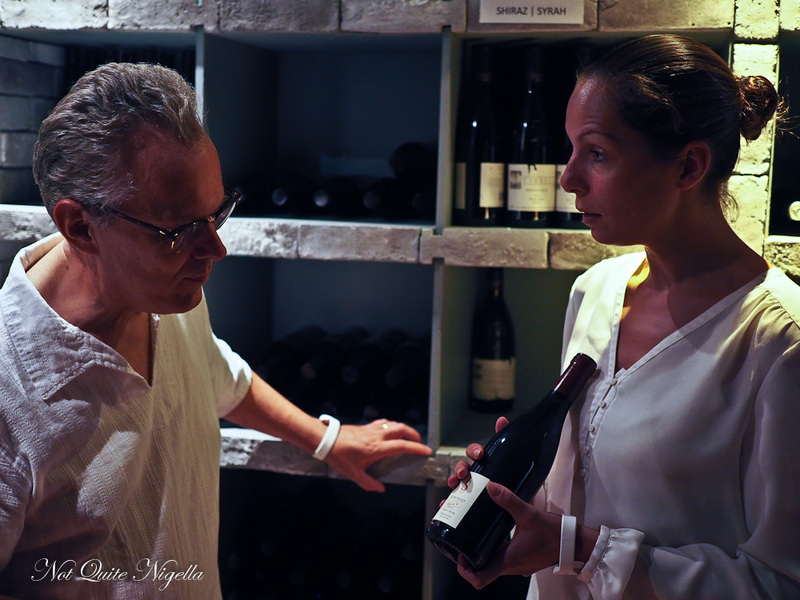 She pours a 2015 Jospeh Drouhin "Laforet" from Burgundy and a 2011 Bertani Catullo from Italy and encourages us to taste and see which matches appeal to us best. My favourite combination is the brie style cheese with a layer of pepper mascarpone in the centre with the Chilean Sauvignon Blanc. Another great combination is the Bertani with the Form d'Ambert or Stilton. Another divine cheese is the Morbier cheese with a layer of ash in the centre. Originally one layer is made with the morning milk and then the other layer the evening milk although nowadays it is produced with a single milking. We also try the charcuterie including prosciutto de Parma, salami Milano, salami Felino, truffle salami from Tuscany and Spanish Iberico salami as well as two types of chorizo, piccante and forte. 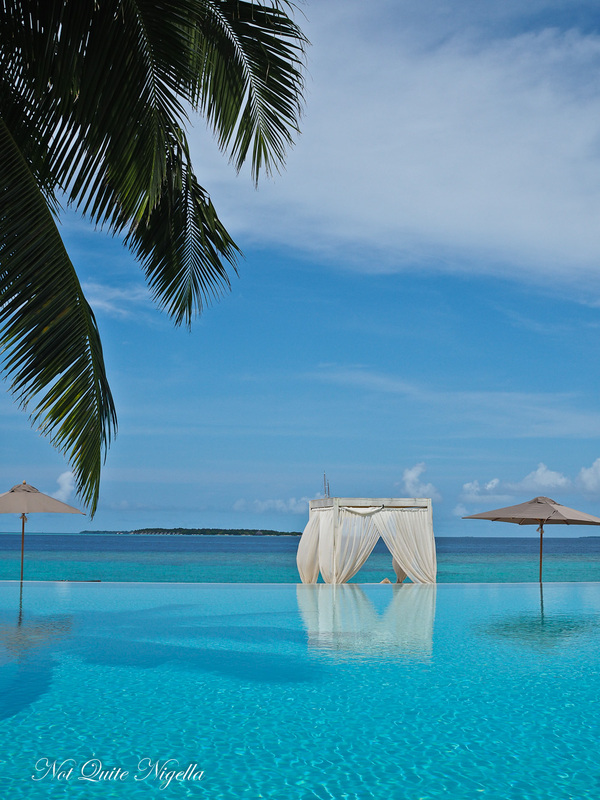 Every Friday night at Amilla between 7:30-8:30pm there are management drinks which means cocktails, champagne and canapes for all resort guests where they can mingle with each other or sit by the pool and watch the entertainment. 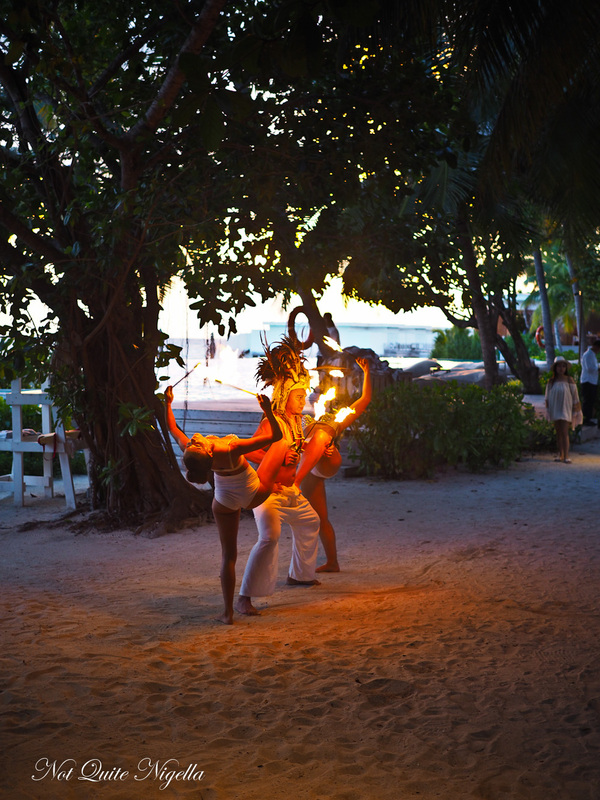 People at Amilla are a bit less outgoing than at Finolhu so they don't tend to interact as much but instead sit watching the fire twirlers weave their magic. 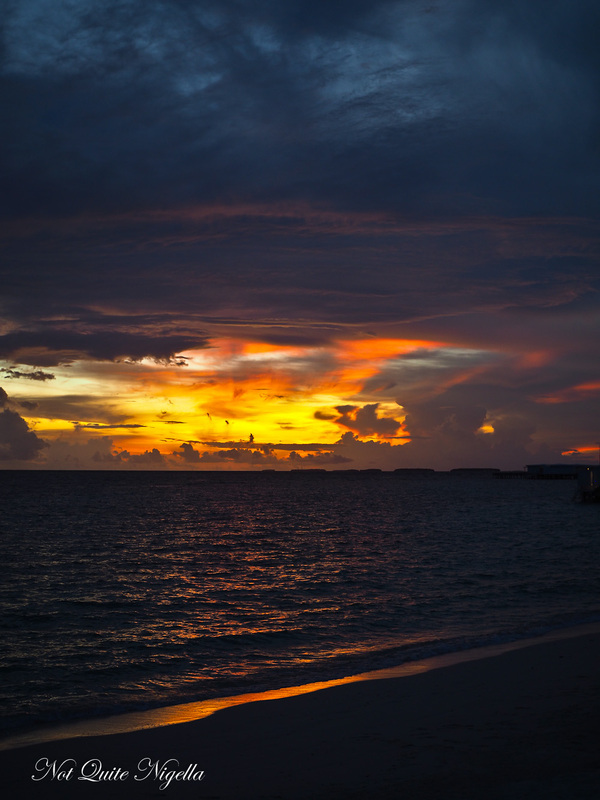 The mood is easy and relaxed. 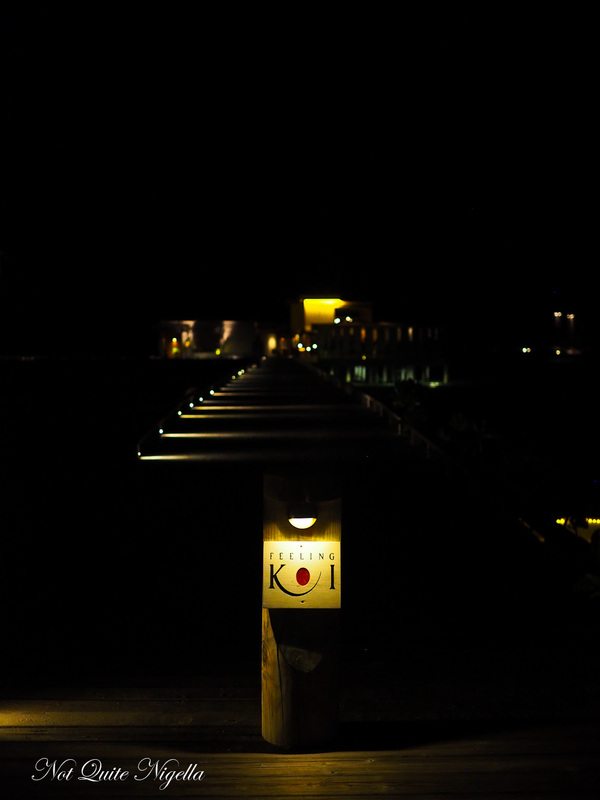 After the performance we make our way to the main jetty where Feeling Koi is located. It is Amilla's Japanese restaurant. 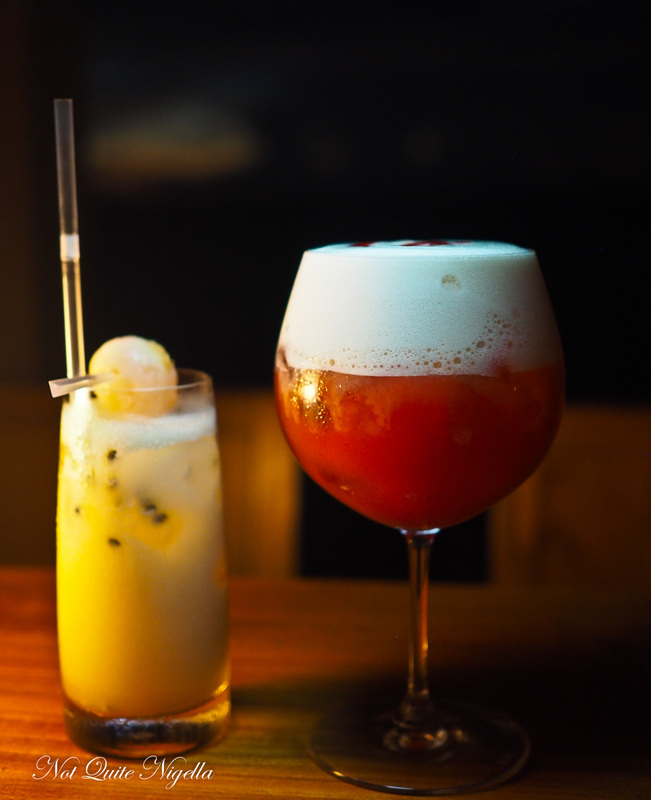 It is said to have a Latin twist but that isn't really apparent with the menu at the time that we dined. We are booked in for the Journey experience which means that we have our starters, main and dessert in different areas of the two level restaurant and bar. Our dinner commences at the 1OAK upstairs bar where we choose a drink from the iPad menu. It's a Red Jasmine rum cocktail strong in jasmine tea for me while Mr NQN has an Asian Infusion cocktail made with lychee, passionfruit, young coconut, sake and vodka which is perfect for this climate. They then bring a selection of starters from their restaurant. Everything is chosen for you based on the best selling dishes. 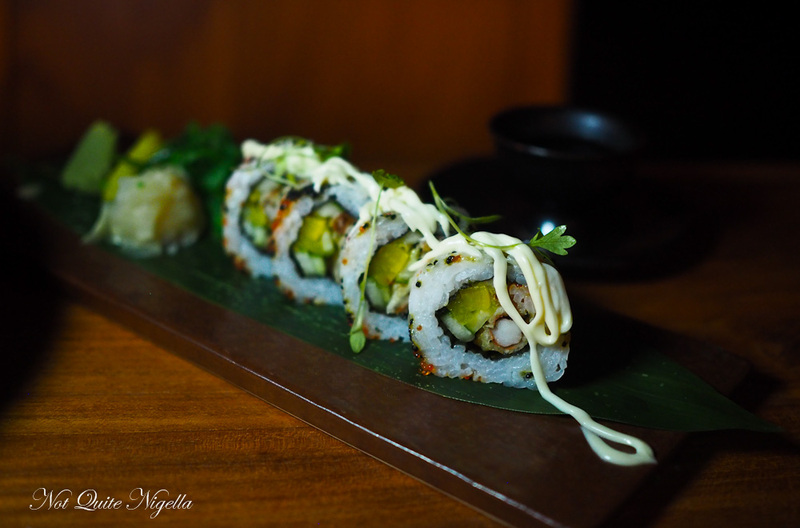 The tempura soft shell crab roll is rolled in roe which gives it a nice pop with the crunch of the tempura soft shell crab. The rice is soft, warm and sticky. 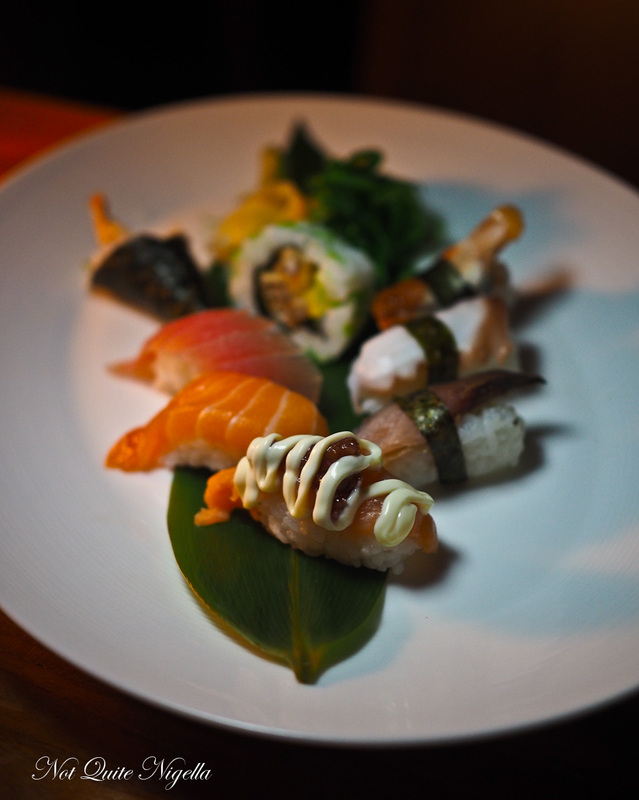 The next item is a selection of sushi from California roll as well as nigiri of Atlantic salmon, mackerel, unagi, Maldivian yellow fin tuna and octopus with seaweed salad and daikon pickles. My favourite is the eel or unagi nigiri that melts in the mouth. 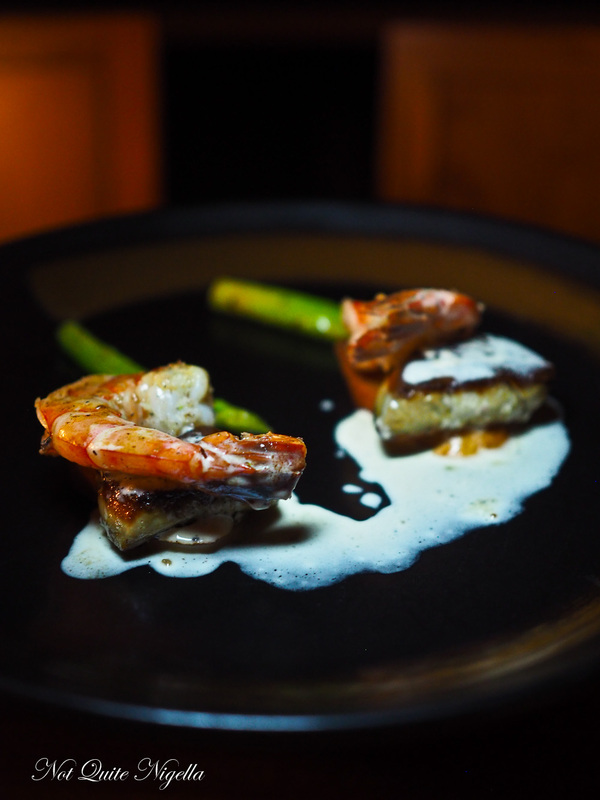 The signature item is the tiger prawn with foie gras, brioche, vanilla and a black pepper cream. The vanilla has a light touch so that it doesn't seem too sweet and the seared foie gras has a divine texture. It just needs a touch of salt or soy to bring it all together. After this they ask us when we would like the kitchen to start preparing the mains and we nod yes. After a short wait the restaurant manager comes upstairs to show us to our table where the food is waiting for us (which pleases Mr NQN to no end, he thinks all restaurants should have the food waiting for you when you sit down ;)). 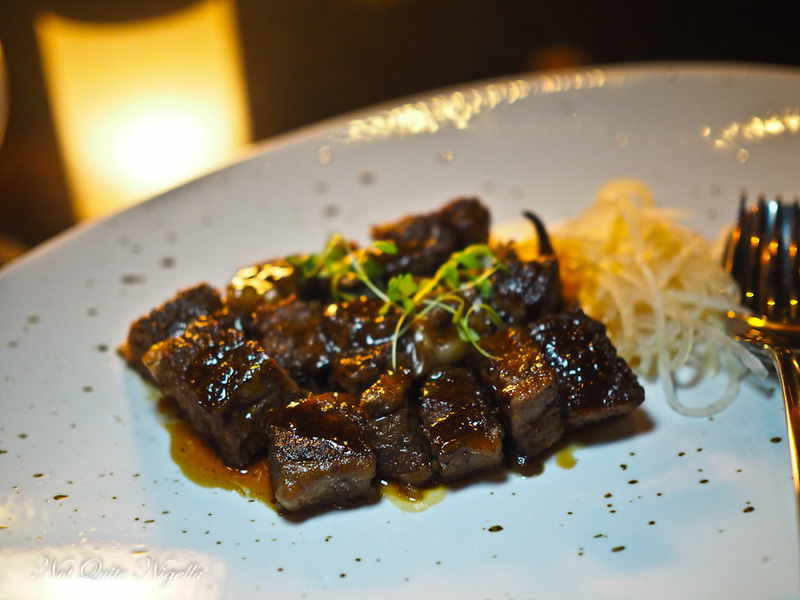 The Kagoshima striploin melts in the mouth with a wonderful umami flavour to it with the soy based marinade. On the sweeter side is the cornfed organic chicken which is marinated in a sake and mirin sauce. It is served with onion rings, snow peas, mini boy choy and a sweet ponzu glaze sauce. 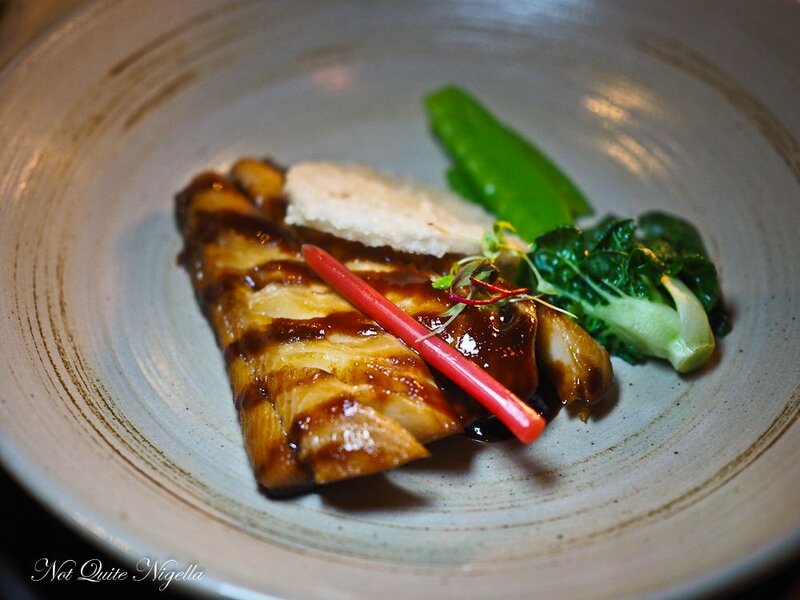 There is also the luxuriously textured miso mirin braised black cod fillet served with a crunchy lotus root, bok choy, snow peas and sesame oil. 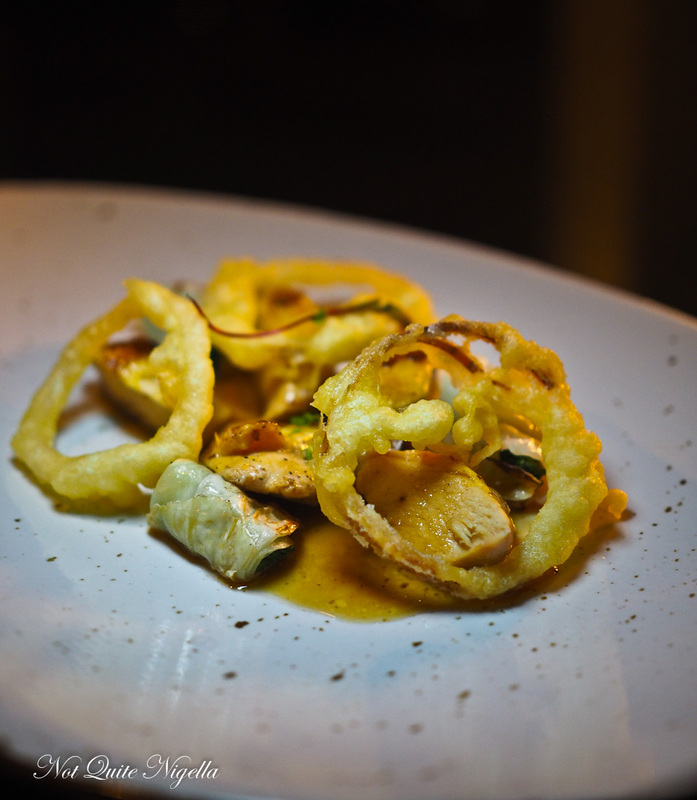 This is a rich dish that is so beautifully texture with a sweetness from the miso and mirin. Once we finish this we make our way to the lounge near the DJ playing. 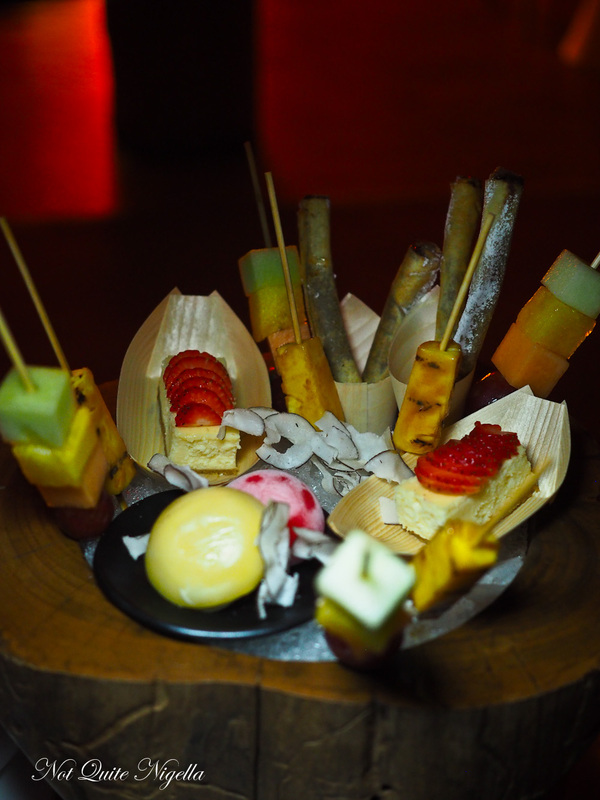 They bring us dessert, a wow platter to share. Served in a large wooden bowlfilled with ice it is topped with toasted coconut shavings, fruit skewers, two pieces of baked New York cheese cake topped with sliced strawberry, fresh fruit skewer caramelized pineapple with coconut flakes, yuzu mochi ice cream and melted chocolate ganache fingers. The cheesecake is light and I love the crunchy biscuit base and the skewers are crunchy and delicious with a melted chocolate centre. We are the last table to leave that evening as we make our way down the boardwalk to our waiting buggy that whisks us home while tomorrow holds another destination. 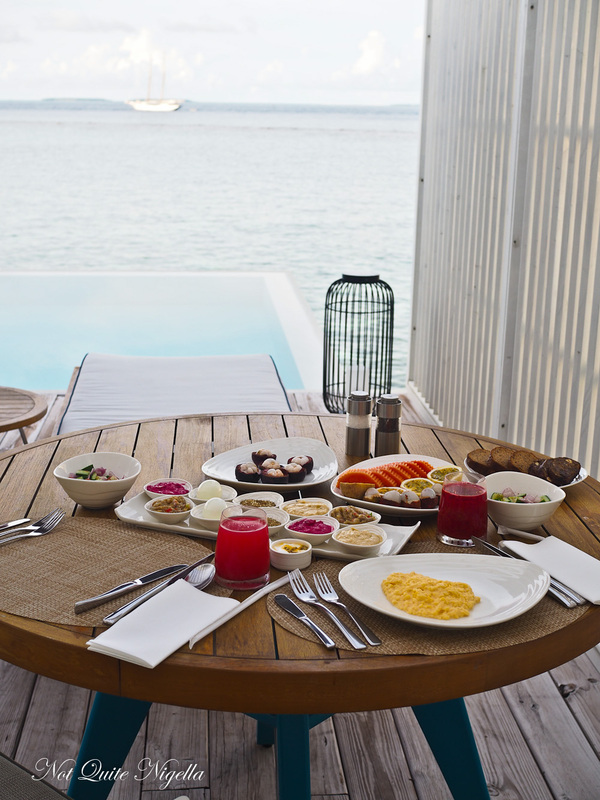 So tell me Dear Reader, how often do you have an in room breakfast when on holidays? And would you like your meal to be waiting for you when you dine out? And do you like meals where you change locations?